Communist country North Korea are threatening the world with Nuclear War on South Korea. Of course no one has any faith in them actually having the resources and capabilities of creating or launching any sort Nuclear Missile into their neighbors, but the threat has been taken very seriously by South Korea and the USA. North Korea has been a secretive communist country since it was occupied by the Soviet Union at the end of the Second World War in 1945. Up until December 2011, North Korea was ruled by the infamous and fanatical Kim Jong-Il up until his death where he was replaced by his equally fanatical son Kim Jong Un. Both Kim Jong-Il and his son believe that North Korea is one of the most powerful countries in the world and have ruled their country under a dictator ship of fear and lies. 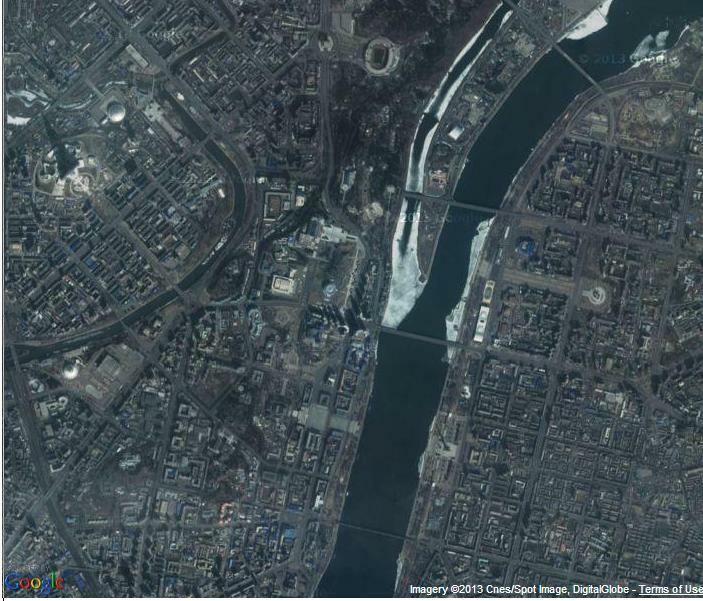 While looking through the great Aerial Map Views Section on Camvista.com I found some amazing Satellite Views of North Korea, unfortunately I could not find any signs of Weapons of Mass Destruction however I did find some great views from the North Korean Capital City Pyongyang. Such as the Kim Il-Sung Square Aerial Map View in Pyongyang, North Korea. The relationship between North Korea and South Korea has always been tense since the divide in 1945. During the late 40’s and early 50’s both sides were in battle over the full control of the peninsula. This resulted in the Korean War in 1950-1953. An agreement was signed by both countries on the border in a place called Panmunjom. I found a great Aerial Map View overlooking Panmunjom which is now a famous tourist attraction for anyone visiting South Korea. In this great Panmunjeom Aerial View you can see the border running directly through the middle of the road and the buildings on each side belonging to each of the countries. 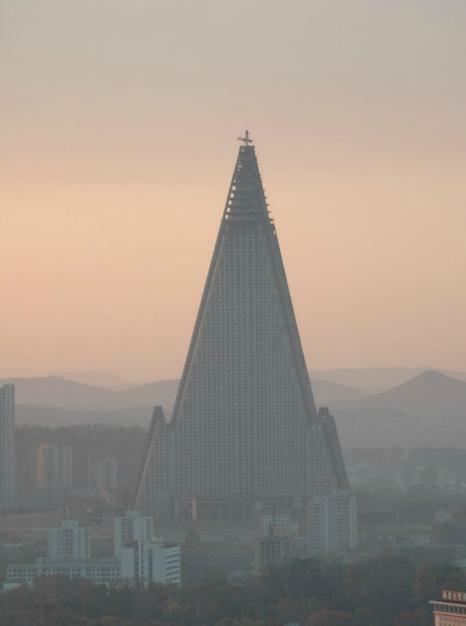 For more great Aerial Map Views of North Korea then check out the fantastic Camvista.com Aerial Map Section and look through some of the amazing views like the spectacular Ryugyong Hotel, the number one hotel in North Korea, located in Pyongyang City Center. This spectacular building dominates the Pyongyang Skyline and looks like an incredible piece of architecture. It would be interesting to find out exactly how many people spend the night in this magnificent hotel. As I mentioned earlier, I did not manage to find any Aerial Map Views of Nuclear Weapons in North Korea, but I did manage to find a great view of a Nuclear Power Plant. I am unsure if it is active or not but definitely a great Satellite Aerial View of a Nuclear Reactor in North Korea. As North Korea is bordered by South Korea and China, the only way to enter this shut off communist country without flying, is by crossing the China to North Korean Border. Not only is this entry point heavily armed, it is also very difficult to cross the only bridge leading to and from North Korea to China. As you can see in this Aerial Map View of the North Korean to China Border Crossing! As you can see, there is a huge section of the bridge missing to prevent people from getting into this mysterious country, or is it to stop the locals escaping to freedom? I guess we will never know but one thing is for sure, for such a secretive country, there are some amazing Aerial Map Views to be seen in North Korea.